Prepare to become famous for making the best pound cake on the block! 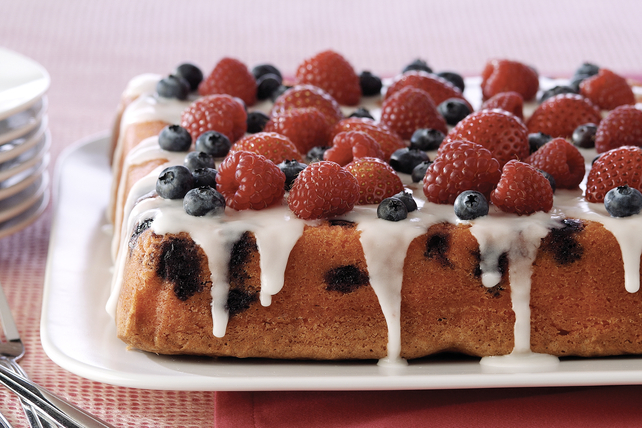 This from-scratch version is topped with glaze and mixed berries. Line 9-inch square pan with parchment. Beat cream cheese spread, butter and granulated sugar in large bowl with mixer until blended. Add eggs, 1 at a time, mixing well after each addition. Gradually beat in flour. Add dry jelly powder and baking powder; mix well. Gently stir in 1 cup blueberries. Bake 1 hour or until toothpick inserted in centre comes out clean. Cool 5 min. Invert cake onto wire rack; remove parchment and pan. Cool cake completely. Mix icing sugar and lemon juice until blended; spread onto top and sides of cake. Combine raspberries, strawberries and remaining blueberries; spoon over cake just before serving. You can substitute a slightly larger size pan for the one called for in the recipe. Try using 12-cup fluted or 10-inch tube pan, or a 9- or 10-inch round cake pan at least 2 inches deep. Do not use a smaller pan or the batter may run over the top of the pan during baking. Remember that a different pan size affects the baking time (a larger pan may shorten baking times), so check for doneness earlier than the recipe specifies.